Do you want to enjoy the properties of grapes to lose weight? 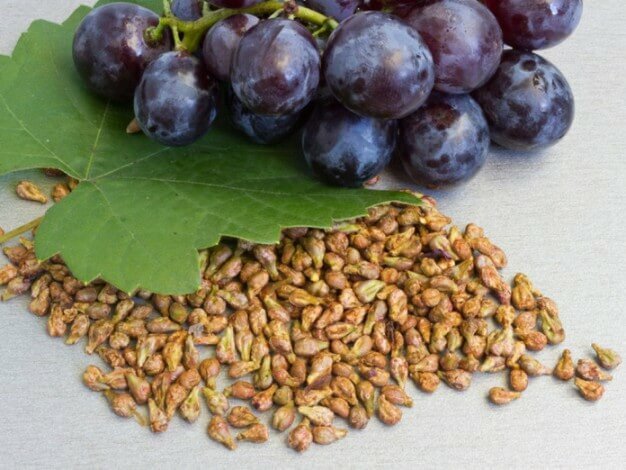 Then you have to know about the extract of grape seed, the differential element that can help you lose weight. The grapes are delicious and a healthy snack for any diet. But its benefits go beyond the taste; these fruits have been used for centuries to treat different health problems. Currently different studies have re-discovered the grape, particularly the extract of its seeds. It contains powerful antioxidants and anti-inflammatory properties that not only improve your overall health, but could also be a great help when losing weight. Grape seed extract is obtained from black grape seeds. The grapes are the fruit of the vine and according to their variety they are eaten fresh, they are used to make juices with depurative properties. The grapes have very interesting properties thanks to their content of flavonoids, tannins, anthocyanins, potassium, magnesium and resveratrol. The extract of grape seeds also have its own: they are antioxidants, they delay aging, they avoid stains on the skin, they improve circulation, they purify the blood, they are anti-inflammatory and they prevent all kinds of diseases. While there are more than 10,000 varieties of grapes, red and purple grapes are the richest in vitamin E, flavonoids and antioxidants such as anthocyanins, among others. A research carried out in 2003 showed that bioactive phytochemicals in grape seed extract inhibit the metabolism of fat. This means that this extract could be used as part of a treatment in order to limit the absorption and accumulation of fat. Despite this encouraging study, there is not much more evidence to confirm that grape extract is beneficial for weight loss. This is why there is still no recommended dose, but currently in some European countries, where it is common to use this extract as a medicine, 100 to 300 milligrams per day are recommended. In addition to these issues, the presence of flavonoids (antioxidants) is always beneficial in any type of diet. This natural remedy is considered safe, but it is not recommended for children or pregnant or lactating women. Side effects may include, itching of the scalp, headache, dizziness and nausea. Therefore, if you decide to try the grape extract and feel any of these symptoms you should stop consuming it immediately. It is also important to keep in mind that you can interact with other medications such as anticoagulants or analgesics, heart medications and cancer. Consult your doctor before starting to use grape extract. You already have an idea of what the grape seed oil is for; if you want to check its effectiveness you can start taking it. You can find the grape seed oil online but also in health food stores and herbalists. The grape seed extract comes in different forms: cold pressed oil, capsules, tablets and powder. Each brand and presentation of the tablets, powder and capsules has different amounts of extract and comes with its indications. However, take grape seed oil on an empty stomach is one of the best ways to take advantage of its benefits, not only to lose weight, because, for example, grape oil for hair is also very good and you can use it by applying it directly on the leather. Scalp and length. On the other hand, if you want to take advantage of the benefits of grape seed oil to lose weight, start your day by taking a spoonful before breakfast.